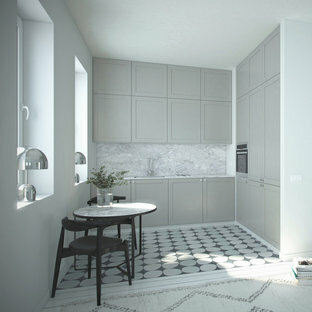 Design ideas for a modern kitchen in Paris. 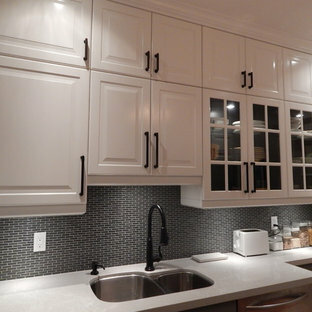 Standard IKEA kitchen in Gladwyne, PA with custom Semihandmade DIY Shaker facing. Photo by Paul Lipowicz. 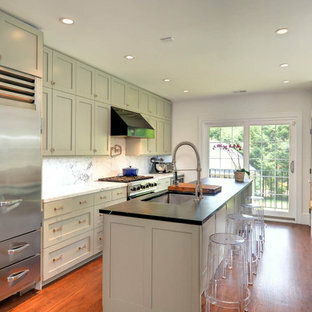 Contemporary galley eat-in kitchen in Philadelphia with shaker cabinets, stainless steel appliances, an undermount sink, white splashback, stone slab splashback, green cabinets and soapstone benchtops. 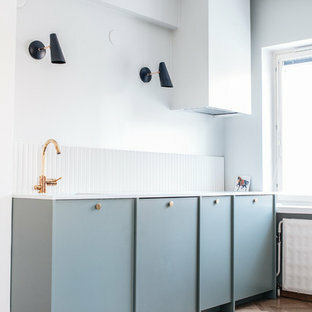 Design ideas for a traditional kitchen in Toronto. 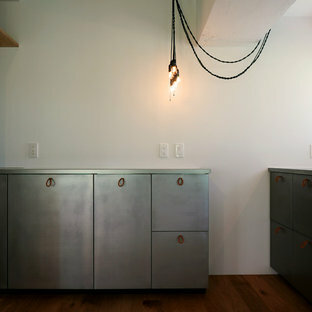 Photo of a contemporary home design in Other. 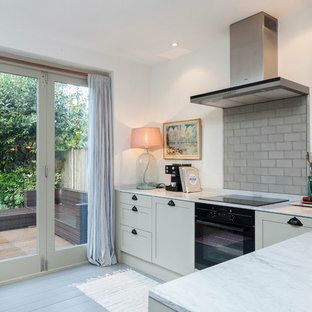 This is an example of a mid-sized contemporary galley kitchen in London with flat-panel cabinets, grey cabinets, wood benchtops, green splashback, ceramic splashback, stainless steel appliances, light hardwood floors and a drop-in sink. 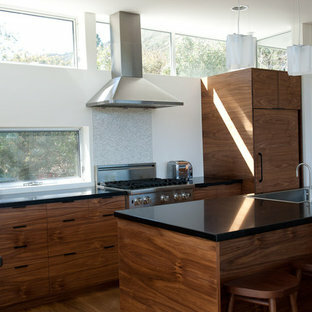 Standard IKEA kitchen with custom Semihandmade Walnut facing in Topanga Canyon, CA. Photo by Bryce Duffy. Inspiration for a contemporary l-shaped kitchen in Los Angeles with panelled appliances, an undermount sink, shaker cabinets, dark wood cabinets and solid surface benchtops. Inspiration for a contemporary home design in Other. 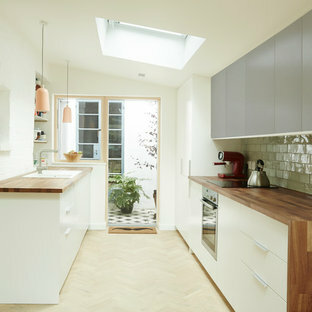 Design ideas for a contemporary kitchen. Inspiration for a modern single-wall open plan kitchen in Tokyo with an undermount sink, flat-panel cabinets, stainless steel cabinets, stainless steel benchtops, white splashback, ceramic splashback, stainless steel appliances, light hardwood floors and beige floor. Inspiration for a modern single-wall open plan kitchen in Tokyo Suburbs with an undermount sink, flat-panel cabinets, stainless steel cabinets, stainless steel benchtops, white splashback, ceramic splashback, stainless steel appliances, light hardwood floors and beige floor. A.S.Helsingö Ingarö doors with Circle brass handles. Built on IKEA METOD cabinet frames. 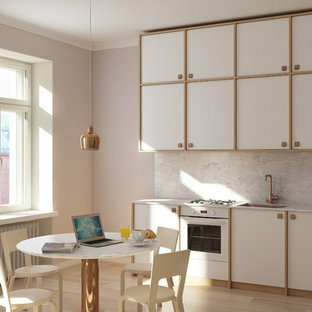 Design ideas for a scandinavian galley separate kitchen in Stockholm with an integrated sink, flat-panel cabinets, grey cabinets, quartz benchtops, multi-coloured splashback, panelled appliances and plywood floors. 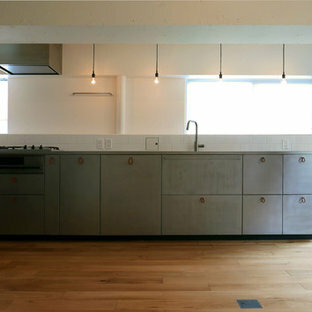 Photo of a single-wall open plan kitchen in Tokyo Suburbs with beaded inset cabinets, white cabinets, stainless steel benchtops, white splashback and ceramic splashback. This is an example of a single-wall open plan kitchen in Tokyo Suburbs with an undermount sink, beaded inset cabinets, white cabinets, stainless steel benchtops, white splashback, ceramic splashback and black appliances. Single-wall open plan kitchen in Tokyo Suburbs with beaded inset cabinets, white cabinets, stainless steel benchtops, white splashback, ceramic splashback, medium hardwood floors and brown floor. Inspiration for a contemporary galley eat-in kitchen in Edmonton with an undermount sink, flat-panel cabinets, white cabinets, black splashback, glass sheet splashback, white appliances, grey floor and white benchtop. 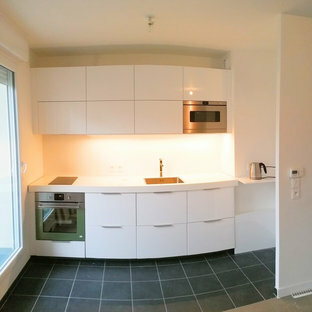 Design ideas for a modern single-wall open plan kitchen in Tokyo with an undermount sink, flat-panel cabinets, stainless steel cabinets, stainless steel benchtops, white splashback, ceramic splashback, stainless steel appliances, light hardwood floors and beige floor. Design ideas for a contemporary single-wall seated home bar with flat-panel cabinets, white cabinets, green splashback and stone slab splashback.